Two years back, I wrote an account of the 2014 harvest which is where the photo above was from. It was nasty. 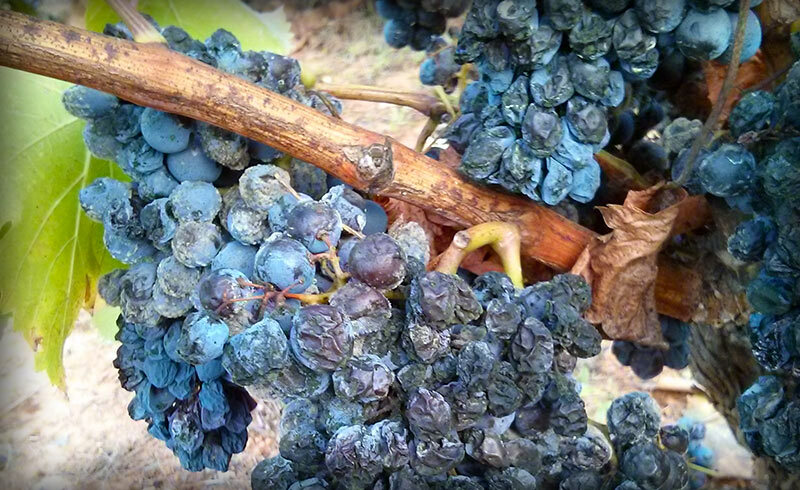 What wasn’t desiccated was full of botrytis or then underripe and green. It took forever to sort out that mess in the field and friends who could usually knock out their vineyard in a day had to take two to get through it. The initial young wines from this vintage started coming on the market last year. Some were okay, others were not but it was quite clear that this was not a classic vintage. And this wasn’t just a local problem. All across Europe this vintage was one that people wanted to put behind them, like a kid who grows up to steal cars or gets in to far-right politics. Good friends had a number of wines that were reductive (that closed sulfur smell when you open a bottle) or green or just well, not really anything I was that crazy about. Of course when talking about Priorat or Monstant, if you can make a vintage, it’s going to be a decent wine and I need to add that I’m just talking about the red whites as the whites from 2014 I’ve found to be simply wonderful. So now in 2016 we’re moving in to the aged releases and again, it’s a bit strange. What I’ve been tasting has had a singular aspect to it no matter where it’s produced which is “forest floor”. Earthy and broody, these wines seem to be difficult teenagers more than anything else although I personally find that this dark manner to them does have some personal appeal. Also, some of the winemakers I’ve talked to say that they’ll need a bit of time to open up and grow out of this state like what they say about the 2008 vintage in Côte d’Nuits. Despite searching some meager threads of a silver lining, it wasn’t the best of years. While no hot, stewed 2011, it’s not a wine for the ages. This is why some wineries didn’t produce their top wine. Two of them that come to mind in Priorat are the Mas de la Rosa of Vall Llach and the 1902 of Mas Doix. It had been a similar situation for both of these wines with the 2011 vintage which they chose not to make either. On the bright side, the fruit that would have gone in to these two top wines, then goes in to the next level down which is the Vall Llach – Porrera and the Mas Doix – Mas Doix. For Mas Doix this is less of an issue as they produce the Mas Doix every year and it was their top wine for some time. In the case of Mas de la Rosa, it means there will be a shortage of the wine as the 2013 is already allotted due to it being a stellar year. Even Parker’s reviewer couldn’t help but give it 94 points despite generally not rating the Vall Llach wines terrible highly which is easier when you don’t taste blind. I should add that myself and others gave it 96 points in a blind tasting. I could undoubtedly wax poetic about the excellent wines that came out of the 2013 vintage but we’re talking about the 2014 vintage here which brings us to the Festa de la Verema. This is a wonderful tasting and lunch put on each year by Terroir al Limít and l’Infernal who are two of the main cellars in the village. Realizing of course that they do a number of village tasting events already, they make this one a bit more interesting by holding it at the quite lovely Cal Compte in Torroja and then invite cellars from other regions who this year were: Fonterenza (Montalcino, Italy), Éric Texier (Rhône, France), Georg Breuer (Rheingau, Germany), and Recaredo (Penedès, Spain). While the whites Rieslings from Rheingau as well as Penedès were a different story, I found similar issues with the 2014 red wines from the other regions as I’d been seeing around Spain. The Teixer Brézème was tight and not wanting to express itself. Texier’s St. Julien-St. Alban and Châteauneuf were a good deal more expressive but these were 2013 bottles. The PettiRosso of Fontarenza was pleasant although with a short finish and the Rosso di Montalcino, while more lifted had the darker qualities typical of the 2014 vintage. As a side note, Francesca and Margherita’s (the winery is run by twin sisters) Brunello di Montalcino was a very different and lovely beast, but it was 2011. In the two local cellars, the l’Infernal wines were extremely closed and el Casot really didn’t want to come out and play at all. This was made all the more prevalent when compared with Aguilera from 2013 which is a boisterous, beautiful wine. The Terroir al Limít wines showed very well which wasn’t a surprise as Dominik is notorious for harvesting very early which benefited him well in that soggy year and Dits del Terra continues to be one of my perennial favorites. Keep in mind that all of this commentary is from a very spoiled vantage point as I’ve been tasting the wines of 2013 and 2015 around these from 2014 and these bookends make for some stellar vintages. Again, the 2014 isn’t bad wine, it’s just different and seeing a cross section of this with these producers from other parts of Europe shows that it wasn’t just isolated to Spain. But it’s definitely worth checking out this year to get a better sense of vintage variation and to understand how “good” wine doesn’t always mean the same thing.